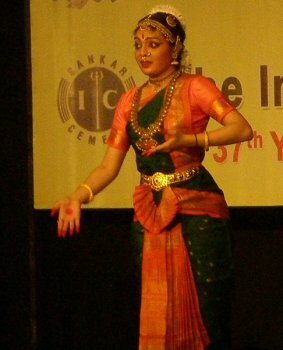 My first season program was of pretty dancer Anwesha Das, now settled in the USA, who performed for Kartik Fine Arts at Bharatiya Vidya Bhavan on Dec 17. A disciple of Urmila Sathyanarayana, she was clad in a dark green costume with orange border. Despite a couple of jewellery malfunction in the midst of an item which she handled without a fuss, her performance was much appreciated by the sizeable audience (some of whom had come for the next music program) that burst into rapturous applause at the end of every sequence of jathis! From Bhavan, a short walk brought me to Nageswara Rao Park where Indira Kadambi and TV Ramprasadh had organized the 2 day, day long fest ‘SaMaaGaMa’ featuring music and dance performances as well as workshops. The low platform served as performance space as well as could seat some audience members at the other end while others were seated around in chairs or under the huge tree, with lots of walkers stopping by to enjoy the performances. With a green light enhancing the greenery behind the stage (a natural backdrop! 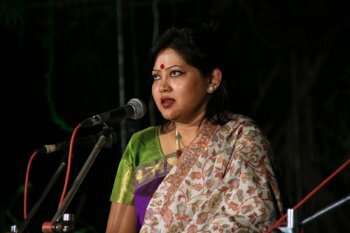 ), and a gentle breeze keeping us cool, Sanhita Nandi’s Hindustani vocal concert was soothing to the ears. The next and final performance of the day was an elegant Bharatanatyam recital by Guru CV Chandrasekhar and his ardent disciples and admirers had turned up in large numbers. He dedicated his performance to late mridangist Adyar Balu who had passed away on 13th. 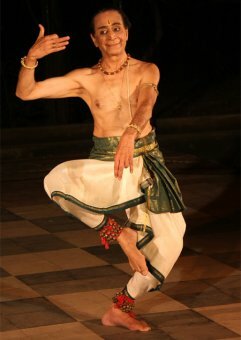 In fact, Adyar Balu was to have played for this performance and at short notice, mridangist Lingaraju was called in. It was interesting to note how keenly he followed the dancer throughout the program and rose to the occasion without having had any rehearsals. The central piece was a varnam in Dhanyasi addressed to Raja Krishnarajendra of Mysore. The audience watched in awed admiration as Guru CVC, clad in off-white costume with dark green sash, mesmerized them with his expertise, perfect araimandi and smooth execution of many movements that would be taxing for most people his age. Jaya Chandrasekhar on nattuvangam, Jyotishmathi on vocal and Eshwar Ramakrishnan on violin completed the music ensemble. It was back to the park on 18th evening in time to see Indira’s talented disciple Komala Kumari Mayshark present a spirited Bharatanatyam recital. Her depiction of scenes from the Ramayana was greatly enjoyed by the little children who were seated in front, watching in rapt attention. Next was an interesting classical fusion music show by ‘Three 4 the Music’ featuring DA Srinivas on mridangam and vocal, Punya Srinivas on veena and Naresh Iyer on flute and vocal. It was a pleasure to see a large crowd enjoying the music program that included Irish and Arabic influenced tunes. 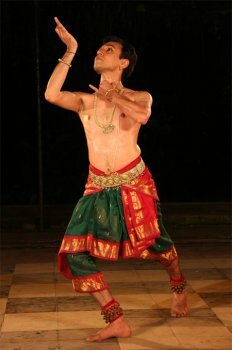 The finale of the festival was a Bharatanatyam performance by P Praveen Kumar from Bangalore, wearing a dark green costume with maroon sash. He was in a state of pleasant shock since he came to know the earlier day that he was one of the recipients of Sangeet Natak Akademi’s Ustad Bismillah Khan Yuva Puraskar. Praveen performed in his usual impeccable style, but confided that having his gurus CVC and Jaya Chandrasekhar seated right in front watching him as well as the thousands who would be watching through the live streaming, made him rather nervous as he had just won a prestigious award, so expectations would be higher, and he had to excel in the already high standard he has set for himself. Incidentally, a friend in the US who had watched the live webcast wrote to say he had spotted me in the audience! The open air recitals were a pleasant change from stuffy auditoriums. It was also interesting to note that using just some basic lights, what wonders can be achieved. 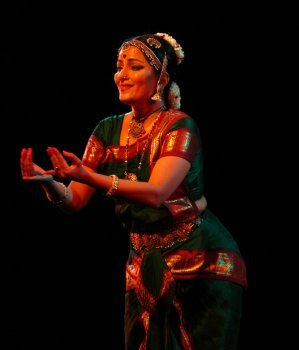 On the evening of Dec 19, as I entered Bharatiya Vidya Bhavan, I saw the organizers rushing backstage to warn the performer that she was exceeding her time limit, so Krishnarpanam by Bharata Nrityam exponent Bala Devi Chandrashekar from New Jersey, commenced late. Performed in a margam format, the items included Swagatham Krishna, varnam ‘Nandagopala’ by Periasamy Thooran, ‘Om Namo Narayana’ by Ambujam Krishna and a thillana by Oothukadu Venkata Subbier in ragam Surutti. Clad in a turquoise blue color costume with copper sulphate blue border, Bala’s swaying hip movements betray that she is indeed Padma Subrahmanyam’s disciple, but she has added her own unique choreographic touches to embellish the style, making it her own. Her unhurried jathis, soulful singing by Srikanth, and a supportive orchestra with Muruganandam on violin, Shrutisagar on flute Venkatasubramanian on mridangam and Balakrishnan on nattuvangam, made it a tranquil evening. The compere’s pleasant and brief announcements and clear diction deserve special mention. Prior to the performance, my colleague and I had an interesting conversation with the director of Bharatiya Vidya Bhavan. On behalf of Arangham Trust, we asked his permission to bring in our own cleaners to get the green rooms and toilet facilities more up to the mark, for the ‘Mad and Divine’ conference. He looked at us first in disbelief and wondered what our ‘international standard’ was! We pointed out that it was only for toilets adjoining the green rooms and he wished us all the best in bettering the efforts of his cleaning team. He then told us that despite their best efforts to keep the place as clean as possible, it was also the fault of the public who really messed up the place. Since Bhavan was a convenient auditorium in the area, many school functions take place there and much as the authorities love to see children having fun, after a program when kids take their tiffin boxes in to eat in-between the program and jump on the seats, the place looks thoroughly messed up after they leave, involving massive cleanup operations and a lot of expenses to set everything right. Since we are always cribbing about auditorium facilities, it was good to hear the other side of the story. I have not seen actor/dancer Shobana perform in ages, so I was back at Bharatiya Vidya Bhavan on 20th evening to see a full house. Vidhya Subramanian was performing her last item and she was also in a dark green costume with maroon border (That color combination seems to be a favorite this season). Expectations were running high as the audience settled down amidst lot of commotion to see the next star performer. “The noisy crowd had arrived early to see the next performance and I felt so let down by the audience decorum. They should be more considerate of the performance in progress,” commented Vidya. 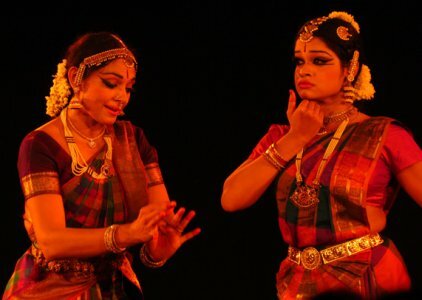 Wearing minimal jewellery, actress/dancer Shobana performed a margam with Srividya Ramachandran, her disciple of 15 years. 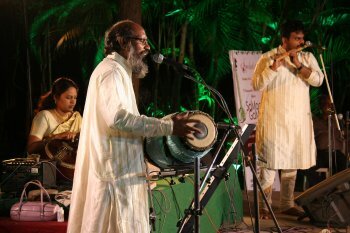 The invocatory mallari in gambiranattai, was followed by a varnam on Kali, dedicated to the goddess of Dakshineshwar temple set to tune by Rajesh Vaidya. Srividya was in a maroonish color costume but Shobana wore a black costume with gold border and that definitely did not go well with the dark blue backdrop. A brief music interlude served as a filler when the dancers had a costume change. Shobana reappeared in a pleasant colorful check sari to do a solo Kshetrayya padam. She was joined by Srividya (also wearing a colorful check sari) for the next padam by Swati Thirunal. The duo concluded with a thillana composed by Lalgudi Jayaraman followed by a folk song featuring devotees of Lord Muruga. The whole performance was vivacious, the dancers covering the space well and dancing in unison, and contrary to what one expected, there was hardly any cinematic melodrama. As is most often the case, one could hardly understand the words of what vocalist Radha Badri was singing. Meeting so many dancers from overseas is one of the nice things about the season. Making use of the opportunity, they dress so beautifully in their Indian clothes. Of course, they are everywhere shopping for silks and dance jewellery.A dancer from London was gasping at the prices of some of the temple jewellery for dance and I helpfully suggested that Jhillmill Plaza in T Nagar is worth browsing around for modest priced jewellery suitable for dance! Her mother Tripurasundari Yoganandan happens to be the first Srilankan student of Vazhuvoor Ramaiah Pillai. Two dancers are very happy not to perform this season but to spend time completing their research for their next project. 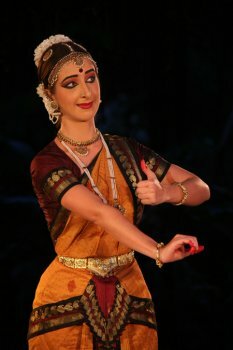 Yet another dancer expressed her shock when as follow up to her application, a leading sabha maama told her he could not give her a performance slot as two senior gurus had advised him not to “since NRI dancers are coming here only for holiday.” Yet another NRI dancer quoted going rates for getting a slot in the season. Some things just do not change!